The threat that new technologies and market evolution have on the current utility business model is very real. In a world of declining load growth driven by energy efficiency and increasing viability of distributed generation, utilities are faced with finding new strategies for success. Meanwhile, it seems that merchant generators who make their money selling power from centralized fleets are even more vulnerable. After all, utilities assume consumers will need a distribution grid for some time and have some regulatory protections. In fact, during the call’s question-and-answer period, Crane made the statement that he believes residential solar will become cost competitive in 20-24 states within 12-24 months. He described a hybrid solar/gas-power Stirling engine technology called the Beacon 10 that he says will create a “non-intermittent” distributed generation (DG) system to combine the best of solar power with the wide availability of the natural gas distribution grid. This differs from many other solutions that depend on large amounts of batteries to firm renewable power. Exciting change for the future? It sure seems so. 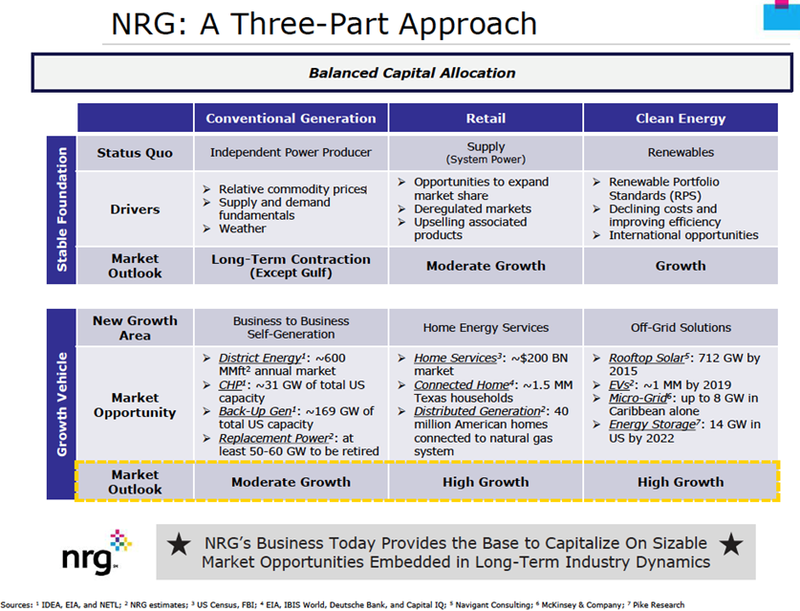 But as Crane reminded everyone at the close of his remarks, success depends on NRG taking care of day-to-day business. If you can’t survive the next few years, you can’t build the future. And taking care of business now requires successfully running a central fleet of generation. This entry was posted in Electricity, Renewables and tagged Distributed Energy, electric generation, Electric Utilities, Energy industry, Merchant Generator, Renewable Energy, solar energy. Bookmark the permalink.